People from across North Carolina had to be rescued from their homes as the downgraded Hurricane Matthew blew out to sea - leaving a trail of destruction in its wake. Flooding was widespread with rivers and creeks bursting their banks and locals wading through streets waist-deep in water after more than a foot of rainfall. In some cases local people were carried from their homes by rescuers. This came even though the hurricane had been downgraded to a storm, reinforcing the power of nature and therefore the importance of arranging travel insurance. 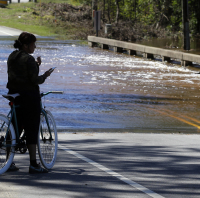 Parts of eastern North Carolina suffered record-breaking floods, according to experts at the National Hurricane Center. There was travel chaos too with closures on the Interstate 95 in North Carolina. The threat of Hurricane Matthew had seen Walt Disney World and Universal Studios closed but the theme parks have since reopened as Orlando started to get back to normal. A bigger clean-up was under way in Daytona Beach - the Florida city right on the Atlantic coast - where windows were smashed and roofs torn from buildings on the main drag and streets blocked with fallen trees and power cables.